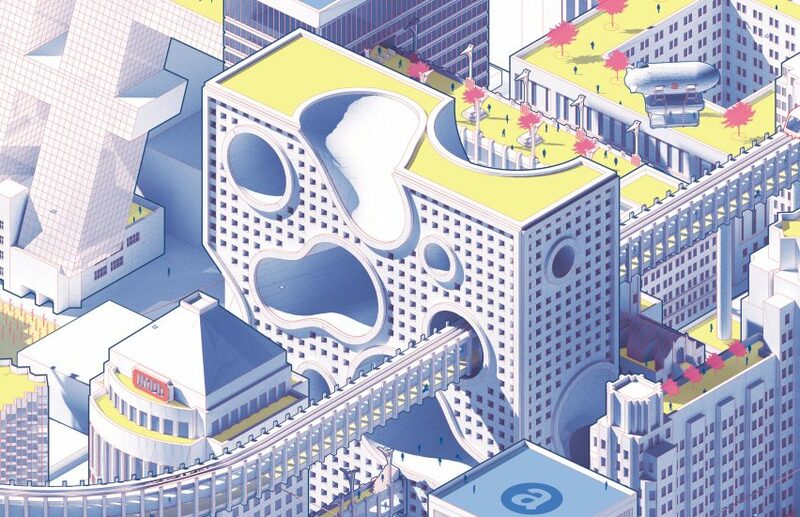 Detroit is taken over by Amazon in architecture student Cody Seipp’s conceptual project, which envisions the US city in 2051 following a major redevelopment orchestrated by the retail giant. 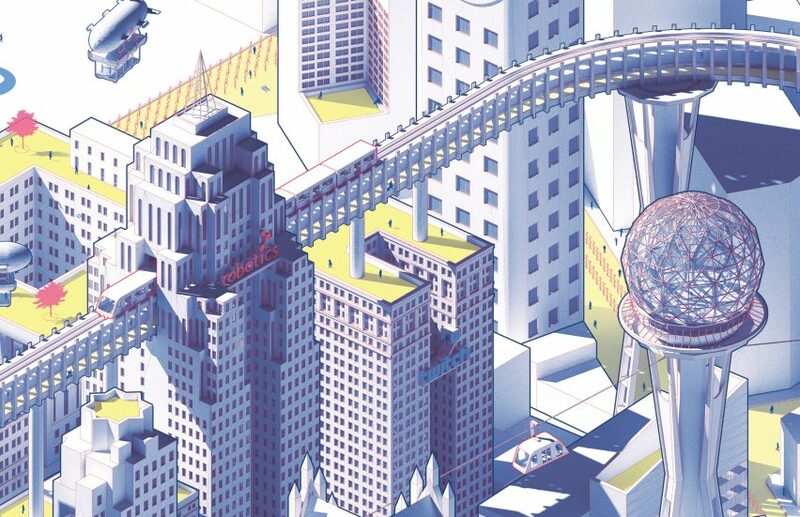 Created by Seipp as his final project at New York’s Rensselaer Polytechnic Institute, Expo ’51 Detroit imagines the US city 33 years after it was acquired by Amazon in 2018. It offers an alternative outcome to real-life events. Detroit was among those bidding to become home to Amazon’s second headquarters in North America, nicknamed HQ2, following its first in Seattle, but lost out in the shortlisting earlier this year. In the fictional narrative, the city won the bid by giving Amazon full control “over Detroit’s policies, activities, and redevelopment operations” in return for major investment. 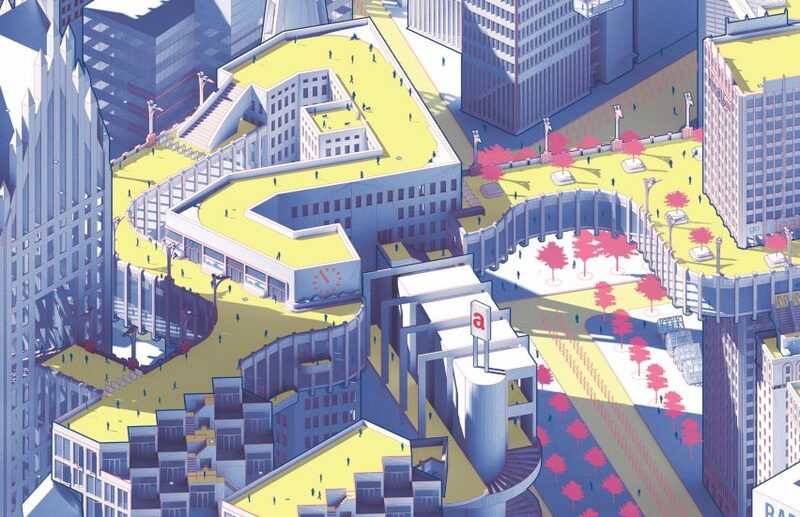 Designed by a made-up team of designers and urban planners called UrbEnact, with think tank Detroit Future City (DFC), Seipp’s scheme aims to better integrate transit and the built environment with the community and public space. 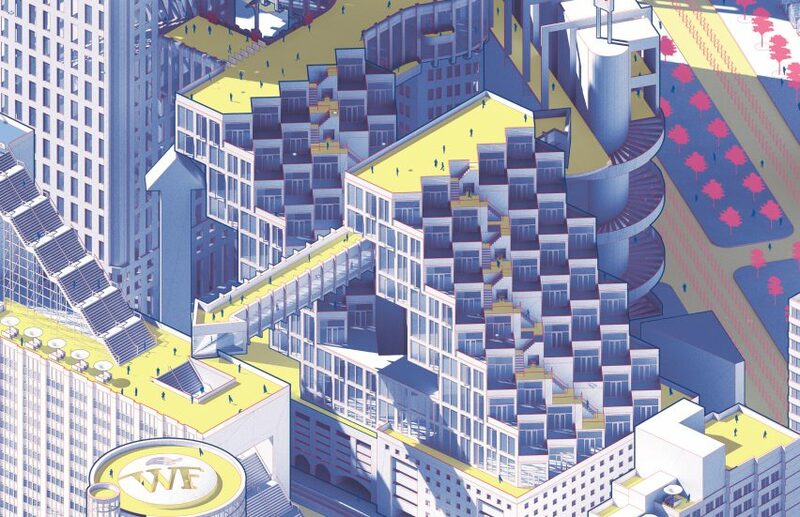 “Amazon executives took the offer and immediately began rebuilding Detroit as a hyper-designed corporate campus that followed the principles of DFC and UrbEnact’s studies,” said Seipp’s project description. 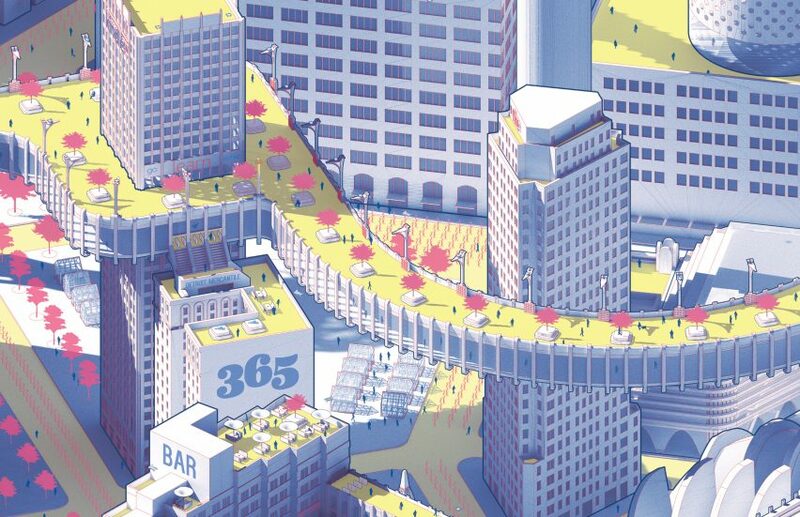 In his colourful isometric visualisations, public space is represented by yellow blocks detailed with pink trees. 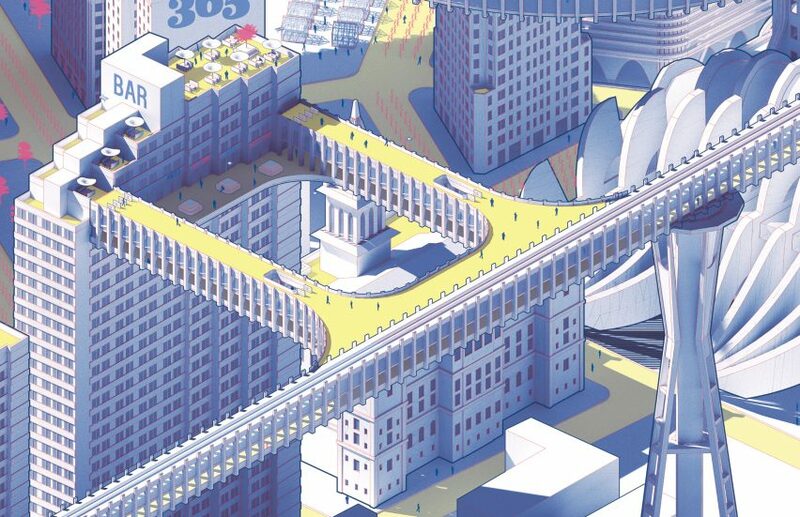 It covers much of the ground, as well as elevated pathways linking buildings, which are depicted in purple. With the ground kept open, transportation is therefore suggested as raised tracks that tunnel through the buildings. Seipp suggests that existing structures will become integrated into the activities of Amazon’s headquarters. A number are topped with Amazon’s logo, one is titled “Prime” as a reference to the company’s subscription plan, while another is home to Whole Foods – the supermarket chain that it recently bought. Amazon subsidiaries like Audible, Air and Kindle are also featured. 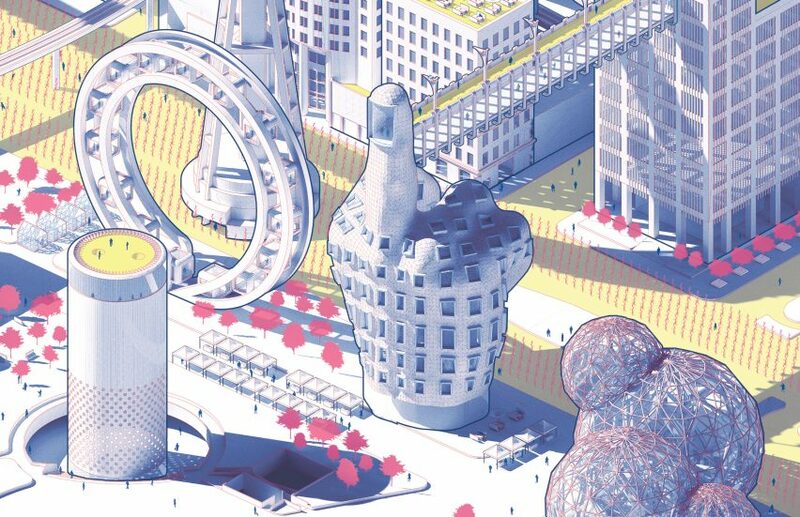 As an additional twist to Seipp’s story, Amazon developed the city with the final goal of hosting the World Expo – an international exhibition celebrating the achievements of different nations – in 2051, 200 years after the first was held in the United Kingdom. With over 150 million visitors expected to attend, the company has employed well-known architects to develop a number of structures for the city, with many referencing those from years before. These include a Ferris Wheel, similar to the observation wheel built for the 1893 exposition in Chicago, and a tower that resembles Seattle’s Space Needle completed for the 1962 event. 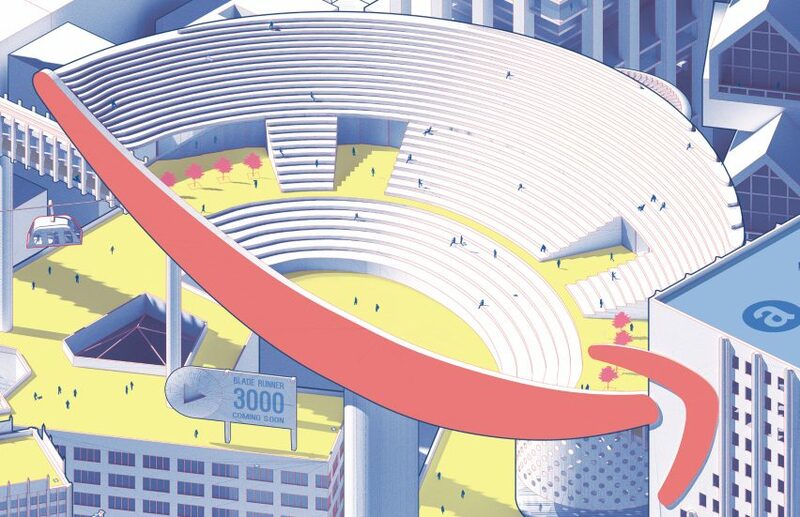 “The city became a collection of some of the most daring pavilions in the history of the World’s Fair, most of which paid homage to previous architectural feats of the fair,” said Seipp.